Abies alba, as described in 1759 by Philip Miller (1691–1771), in The Gardeners Dictionary, 7th edition, is commonly known as European or common silver fir, as well as abeto in the Spanish language. The species name simply translates into "white" in the Latin language. Description. 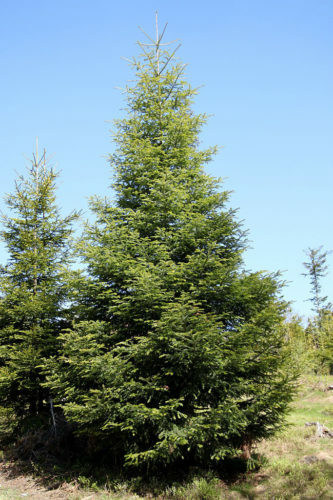 European Silver fir is a large evergreen coniferous species of tree that grows to mature heights of 130 to 165 feet (40 - 50 m) tall, exceptionally to 200 feet (60 m), with with a trunk diameter of up to 5 feet (1.5 m) wide, measured at breast height. 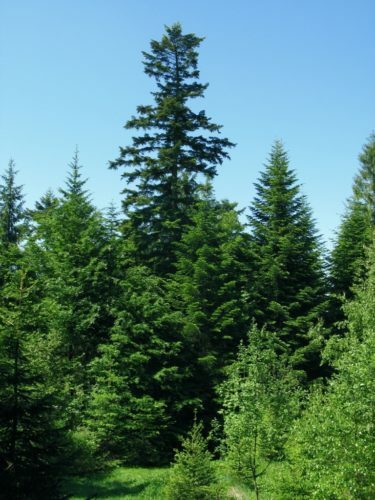 The largest measured tree was 223 feet (68 m) tall with a trunk diameter of 12.5 feet (3.8 m). Stems are straight with gray bark and scaly texture. Older stems are brown, rough and pubescent. Foliar buds are ovate, resin free or slightly resinous. The leaves are needle-like and flattened, measuring 0.72 to 1.2 inches (1.8 - 3 cm) long and .08 inch (2 mm) wide, colored glossy dark-green above, and with two greenish-white stomatal bands below. The leaf tip usually slightly notched. The seed cones measure 3.6 to 7.2 inches (9 - 17 cm) long and 1.2 to 1.6 inches (3 - 4 cm) broad, comprised of about 150 to 200 scales, each measuring 1 to 1.2 inches (25 - 30 mm) wide with an exserted bract and two winged seeds that disintegrate when mature to release the seeds. 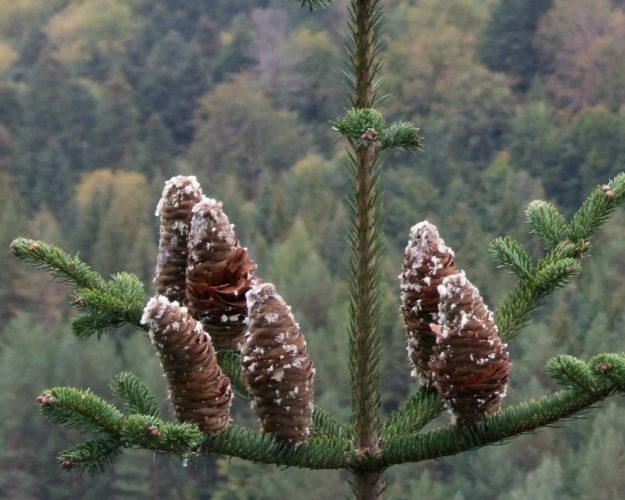 Cones are greenish when young turning to dark brown when mature. Distribution. This species is native to the mountains of central and southern Europe, from the Pyrenees north to Normandy, east to the Alps and the Carpathians, and south to southern Italy and northern Serbia, where it integrates with the closely related Bulgarian fir (Abies borisii-regis). It can be found at elevations of 1,000 - 2,100 feet (300 - 1,700 m), mainly over 1,500 feet (500 m), on mountains with annual rainfall of over 30 inches (1,000 mm). Hardy to USDA Zone 5 — cold hardiness limit between -20° and -10°F (-28.8°C and -23.3°C). Abies alba — a closeup of foliage and mature seed cones. Abies alba — a mature specimen growing in nature in Skalité, Slovakia near Zwardoń Poland.